Dedicated to providing the best in Quality, Conformation, and Personality in All of our Animals! Is there any better way to start the morning then with a nice hearty breakfast of homegrown food? Not in our minds! 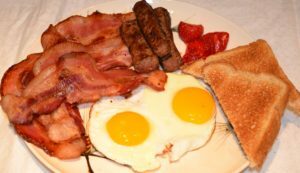 Before the boys went to school today, they got a delicious (and filling) breakfast of bacon & sausage from our grass fed pigs and eggs compliments of our free-range chickens! When you are raising three boys you understand the importance of a filling meal LOL! ← Life on the Farm!